From October to December 2018 the MoT+++ space will be converted into the working studio of visual artist Wu Chi-Tsung. During his residency, Wu Chi-Tsung will develop new works in his experimental photography series of Cyano-Collages. The public will have the opportunity to see Wu Chi-Tsung’s work in progress on select dates during this period. Conventional cyanotype photography uses objects placed on paper to create a negative or imprint of the object in white against a cyan-blue background. The paper, having previously been covered with a solution, is exposed to an ultraviolet light source, such as sunlight, causing a chemical reaction that results in the distinctive blue colour, and leaves unexposed paper white. 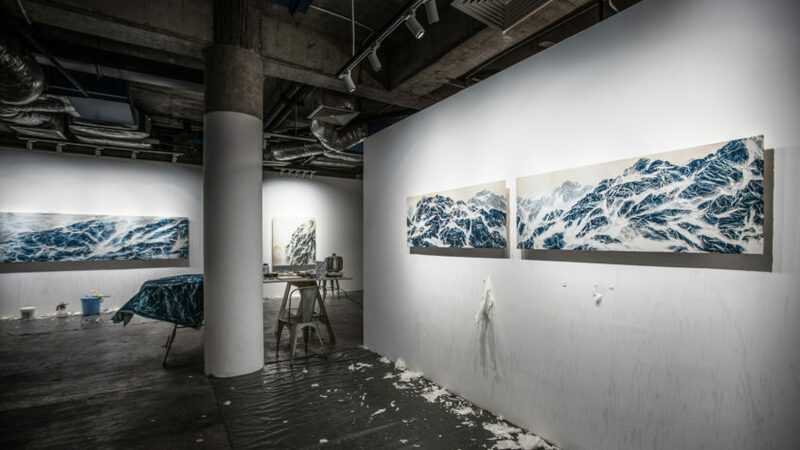 Wu Chi-Tsung uses the cyanotype method to create large abstract photographic works that echo the mountainous landscapes of traditional Chinese Shan Shui ink and brush paintings. Following a two-month residency at MoT+++, Wu Chi-Tsung’s studio will be opened to the public and placed in conversation with the installation work ‘Summer Grasses’ by Bang Nhat Linh. visitors are welcome to MoT+++ to see the interactions between works from the two artists. originating from Hanoi and Taipei respectively, Bang Nhat Linh and Wu Chi-Tsung’s artworks sensitively respond to centuries of geopolitical tensions in the region, as well as the personal histories of each of the artists.